I'm 64 and hate to admit that I've been a lapsed Catholic for a good many years. I think my decision to leave the Church was like the straw that broke the camel's back when, as a teenager, my parish priest singled me out during mass to tell me what page we were on in the hymnal. A teenager, I had better things to do to follow along in the hymnal. Like check out the girls in the pews around me. At least I wasn't sneaking out for a smoke with my buddies. So at my age my memory's a little hazy but I can recall my days as an altar boy in my early teens. These were the days before they turned the altars around where the pedophiles had to face the congregation while saying mass. (Did I just say that out loud?) Funny, being an altar boy to me back then was like going to Cubs or playing baseball. It was just another one of those past-times. It was a little inconvenient to be an altar boy. We had to rise early because we served mass Monday through Saturday at 7am each day. That doesn't include being picked by our priest to serve on Sunday the be-all day of worship in Catholicism. Every Saturday we'd check the list in the sacristy to see who had made the grade - as if our knees weren't sore enough already. 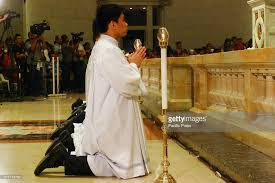 Now I don't recall how many times we genuflected during daily mass but multiply that by seven and that's a lot of kneeling. Some of us would be pretty tired with all this genuflecting. I remember seeing a fellow server ring the bells, move to stand and genuflect and faint dead away, landing flat on his face, with a huge bang causing a few chuckles from his fellow acolytes near the altar. I remember another occasion, after a week full of genuflects, when I asked the priest for my allowance. Altar boys were paid 60 cents a week but he'd forgotten to pay me. Well he blew his top, threw the money at me much like Christ at the money lenders in the temple and gave me a lecture about asking to be paid. The parish must have been running low on collections because from that point on there were no more payments to altar boys. Damn. All that genuflecting for nothing. Needless to say I soon switched from serving mass to bowing down to catch a softball. Lord, and the coach, knows I had a lot of practice. This week's prompt from the folks at Studio30+ was genuflect/bow or curtsey. I don't recall curtseying in my youth so I had to go with genuflect.